Barely a month after the Accra Metropolitan Assembly's (AMA) launched a decongestion exercise in the Central Business District of Accra, some recalcitrant traders have returned and completely taken over the pavements again. 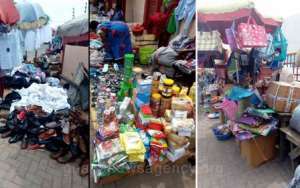 Ghana News Agency monitoring on Wednesday revealed that the traders have defied AMA's directives to keep-off the pavements, and have again taken over displaying their goods on the pavements, with some bold ones spreading their stuffs on the edges of the road obstructing the free movement of pedestrians and vehicles. Others have also adopted other means of attracting customers by holding few items and intermingled with the pedestrians, whilst making gestures to show that the items were for sale, scores also stand at pedestrian traffic cross point to woo customers, GNA observed. GNA also observed reduction and in some location, absence of security and AMA City Guards who were deployed initially, to help enforced the directives and efforts to ward-off the traders. At the Tema Station and connecting routes, GNA observed that the traders had returned in their numbers doing brisk business, displaying goods including food stuffs, clothing, mobile phones, among others disrupting movement. Other traders around the Electricity of Ghana offices, towards the Ghana Law School, the roads around the Makola Market, Tudu Lorry Station, Kinbu Secondary Technical, the Kinbu Gardens towards the National Theatre had all been invaded by recalcitrant traders. The GNA also observed few AMA City Guards along some of the routes directing and warding off pedestrians from using the main roads, but failed to sack the traders and hawkers on the pavements. Speaking to the GNA, Madam Efua Amoakoa, a beverage seller said, 'although I respect the directive of the AMA to vacate the pavements, I have nowhere to go than to sell here to make a living'. Mr Edward Kumah, a pedestrian said the AMA should be more proactive in ridding the streets and pavements of the hawkers in order to keep the City clean. On Monday January 8, the AMA pulled down several illegal structures along the streets, cleared traders and hawkers off the pavements in a renew efforts to decongest the city. Even though some pessimists classified the exercise as a 'Nine Day Wonder,' the AMA insisted that the decongestion exercise was going to be relentless, consistent and in fulfilment of President Nana Addo Dankwa Akufo-Addo's aim of making Accra among the cleanest city in the world.